All networks apart from directly connected will create an ESG (yes, even isolated network requires an ESG!). Just don’t be fooled during some test that they are not visible in vSphere as soon as you create new vApp/Org VDC Network. 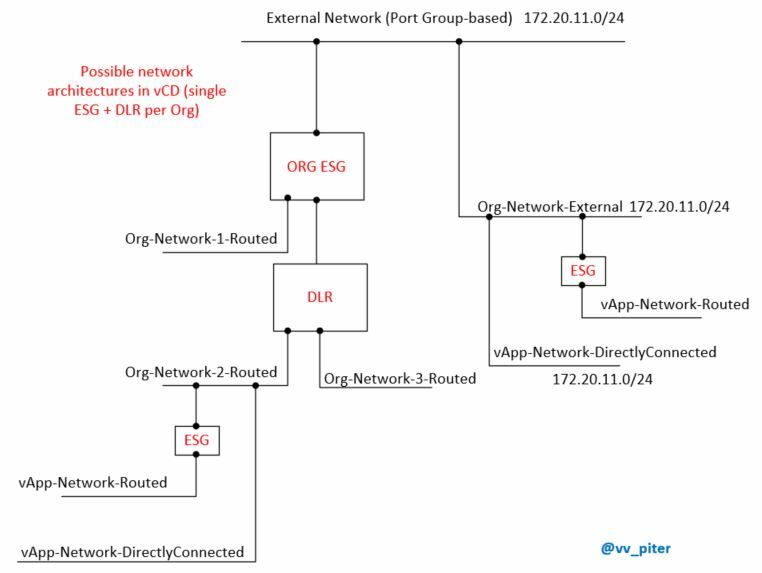 ESG as well as port group on DVS will be established not at the time of vCD network creation but when you connect and power a VM to this network for the first time. To understand how we can mix and match these networks I’ve created a diagram as a reference mostly for myself but maybe it will be helpful for you as well as I didn’t find any diagram covering all options. 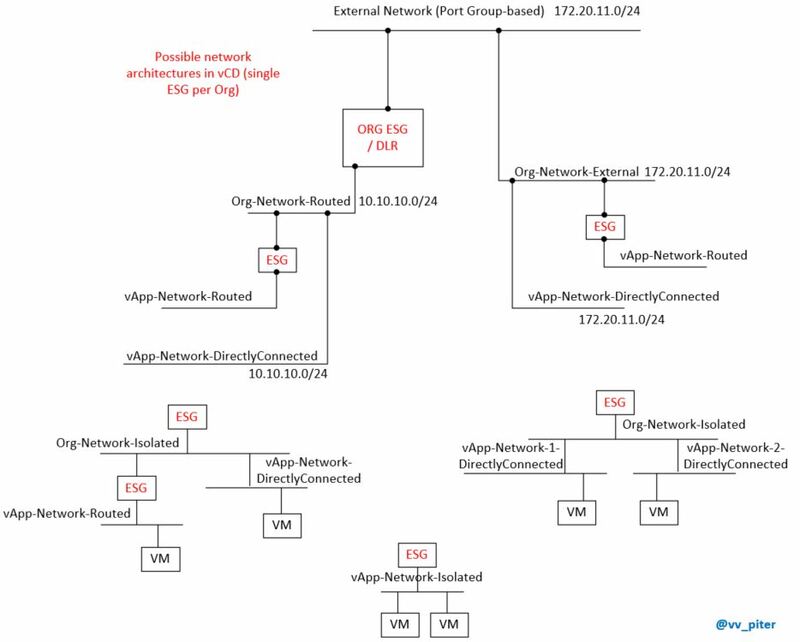 So here we have a vCD network diagram starting from an external network combining all (apart from fenced one) options. Plus another diagram including ESG as an Org perimiter interconnected with DLR. Hope it will be informative, if you have any comments or questions, don’t hesitate to write a comment! vCloud Director 9 – Released! 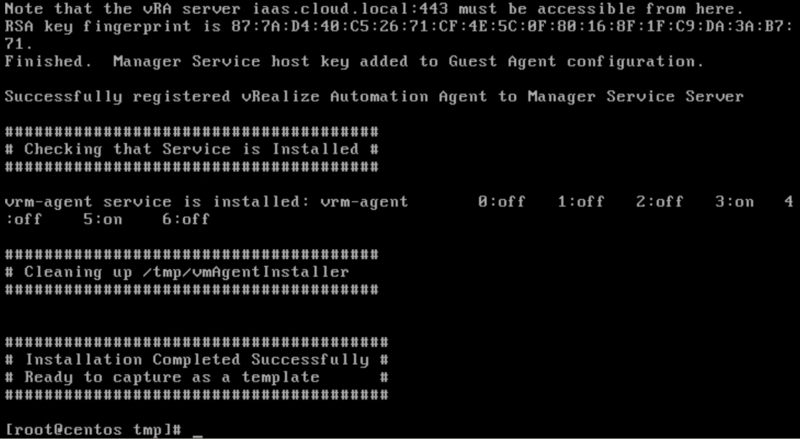 Today new version of VMware vCloud Director for Service Providers was released. There are a few more as well as a list of known issues resolved. Release notes for the product can be found here. Complete list of new features and enhancements could be found here. Tomorrow starts VMUG Virtual EMEA 2017 – it is a great oppportunity for all of those who missed VMworld or was not able to participate in-person or even online. It is a huge oportunity to learn about newest technology from VMware and supporting companies, play around with dedicated Hans-on labs and so on. As of VMUG website definition it is a FREE day-long event is meant to empower you through education, training, and collaboration – all with the goal of improving your projects and impacting your career. 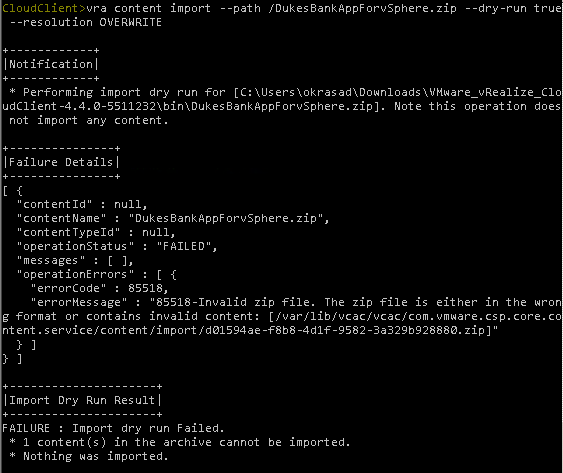 But going back to vRA Dukes Bank App – after successful import you have to configure the blueprint. 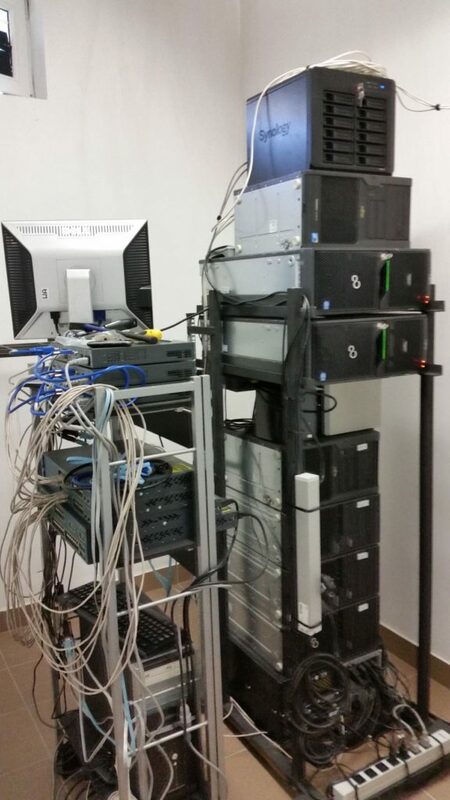 In case you use DHCP address allocation you must add a dependency from Load Balancer Node machine to App Server node. Simply put an arrow to connect them. That’s it now you are ready to resuest and test your sample Dukes Bank Application. It is almost a tradition or habbit for me to share my experience about VMware exmination taken so far. 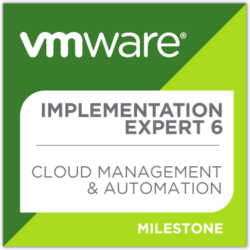 Well, it happened, I eventually passed the VCAP6-CMA Design exam which together with previos passed VCAP6-CMA Deploy exam gave me VCIX6-CMA tiltle and badge. It looks like this: Nothing special, it was not an easy way to get it, though! The biggest problem with that IMHO is that it is and old version which is based on vRA 6.X, whilst we currently have 7.3 available since sometime already.. Besides that I experienced a few additional problems with Pearson Vue/ VMware certification engine which made me to take it each exam more than once. And still it’s version 6 and a few days ago VMware announced new versions of VCAP certs, however that’s only Design ones. There is nothing more to do right nowe, just prepare for new version 🙂 which as a certification addicted I will for sure try to gain. P.S. to be honest VCAP6-CMA Design exam was the most tricky one I have ever took so far. Have you just installed the vRealize Automation in your lab and do not know how to start the journey with services? The Dukes Bank for vSphere application might be a perfect start for you! But what is that mystery Dukes Bank application ? It is not widely known that there are let’s say “embedded” samples of multi-tiered vRealize Automation blueprints that includes multiple machine components with networking and software components. The reason that it is not known by many is that they are not available ad-hoc after installation, you will not see them inside your catalog. To publish these services in Tenant’s catalog you need to import and configure it first. Bellow I described the procedure how to import and publish these services, in another article you will find out how to configure it. The ZIP file for Dukes Bank sample application blueprint is include on the vRA appliance, however to import it you have to use vRealize Cloud Client which can be downloaded here. 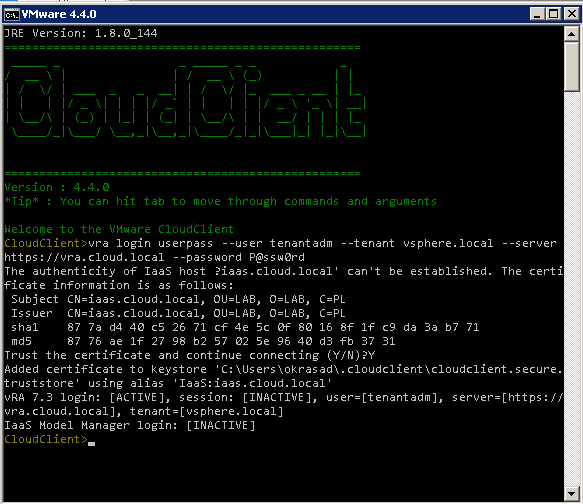 vRealize CloudClient is a CLI utility that provides verb-based access with a unified interface across vRA APIs, it is available since vRA version 6.2. The purpose of CloudClient tool is to create a layer of abstraction between vRA and end consumer, I mean Administrator of vRA to increase the ease by which he is able to run automated actions against vRA. It is worth to meantion that this tool is not a REST or SOAP API. It uses the vRA API instead. 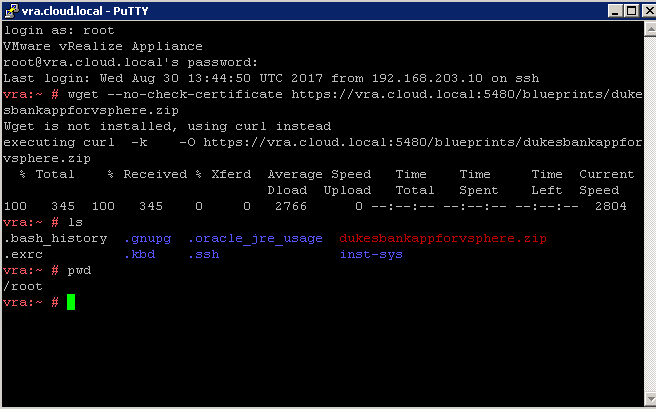 Going back to the point, after downloading the CloudClient you can run it from Windows as well as Linux, however I realized that if you want to import Dukes Bank application you must run it from vRA appliance. 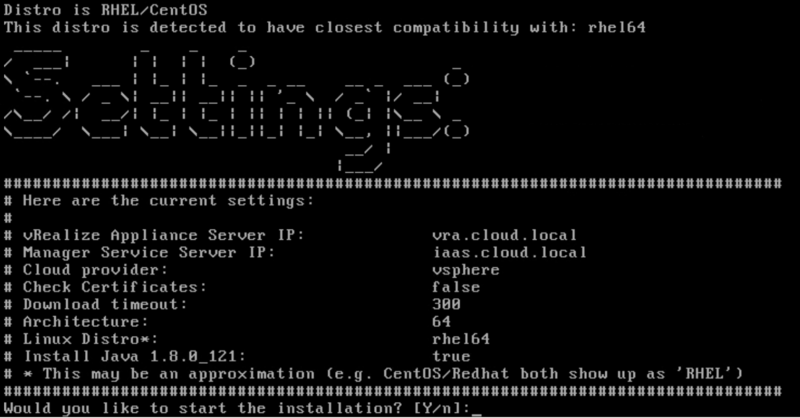 Well, my recommendation is to copy CloudClient into vRA appliance and run it using cloudclient.sh. Then you could copy it to /tmp for easier navigation. After successful login you can validate and import the package. NOTE! Pay attention to capital letters, it is case sensitive. And that is it, the first step to deploy sample blueprints is done. You can validate that these packages are imported by from your vRA console. You need to log in as a user with software and infrastructure architect privileges. The Dukes Bank blueprints and software components on the Design > Blueprints tab and the Design > Software Components tab. VMware Log Insight is still one of the VMware’s products which are not widely known and used (especially in Poland). In the past Log Insight was included in vRealize Operations, nowadays it is a separate product which is available in two licensing models. The first one is per operating system image (OSI) with one flat rate for collecting logs from any server, virtual machine or hypervisor. The second model is per CPU, for one flat rate fee for collecting all logs generated from the hypervisor and any guests on a single CPU socket. For more information about specific features and licensing please visit VMware Log Insight Site. For those who are not familiar with this product – Log Insight is a software for log collection and corelation. But do not think about it as about simple syslog – it’s not! Let’s see how it looks like. The installation proces is really simple – it’s an appliance, just a few click and it’s ready to use. The first step after installation is to integrate with vCenter server. 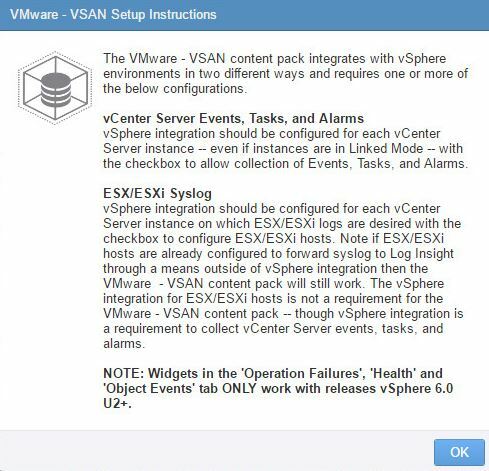 Doing this you gain also integration with all of your ESXi hosts which are automatically set to send logs information to Log Insight. After integration you will see all of you objects (ESXi hosts for this moment) at dashboards with charts which summarizes different types of events for different opbjects. These dashboards can be customized to fulfill requirements of an organization. After clicking on specific events you are automatically moved to interactive analitics module. Then you could create specific filters to found more specific logs and correlate them with specific events. The phrases which you are looking for are marked by a specific color to make it easier to found necessary information. I started to test Log Insight in out lab since I’ve found the new management pack for VSAN. It’s worth to notice that even without it there are some information about VSAN through integration with vCenter. However, using management packs you can receive more precise automated analytics about the events and problems in your environment. All the available content packs can be viewed from Admin->Marketplace tab. 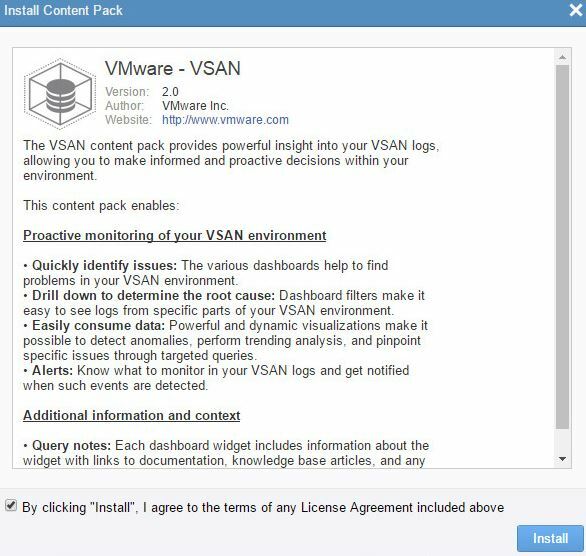 The process for installation of content pack for VSAN is almost automatic. You just need to select it and click install. And if you have vCenter already integrated (6.0 U2) it will be be up and ready at once. I also realized that there is available content pack for Synology DSM. I’m using Synology VSA as a storage for my nested labs, so I didn’t neglect to check it. Again the installation is as simple as 2 clicks. The only difference here is that you have to log in into DSM and configure the logs sending to your Log insight. After that the new section for Synology DSM will be available in your Log Insight. A few months ago in this post I wrote about a new VMware exam which wasn’t listed in the official exam list in these days. Nevertheless, that was time when I almost finished my lab deployment of vRA and taking into account that the exams in beta phase costs only 50 $, I decided to try myself. Another free eBook from VMware! After Network Virtualization for Dummies, VMware published today another book from the series – Cloud Management for Dummies. It can be downloaded at this VMware site. The one thing you need to do is to sign in and download.